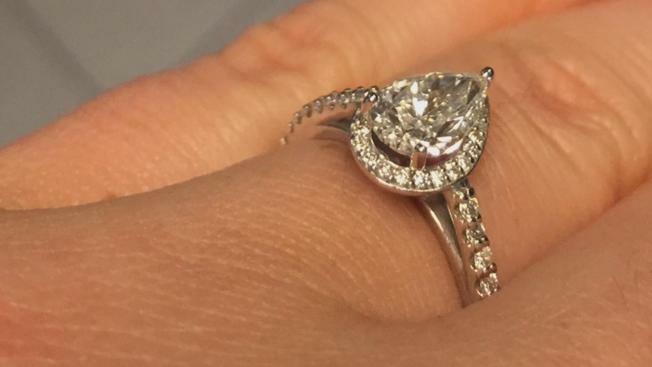 A South Bay woman whose wedding ring was stolen in a car-break-in in San Francisco is offering a reward to get it back. Carrie Perez's cherished ring was stolen April 8 on Golden Gate Avenue while she and a friend participated in the Rock 'N' Roll Half-Marathon. The Morgan Hill woman has photographs of the ring and the people she believes stole it. She said when she returned to her car that day, she knew right away what happened. Sure enough, when she checked the trunk, everything in it was gone. "Duffle bags and my purse, and that was the worst thing because my engagement ring and wedding band, which I can't run with, were in my purse," Perez said. "I got really upset and tried not to tear up. The bags are just things, but we only got married seven months ago. Obviously, the ring is super sentimental; it means a lot." The thieves quickly racked up hundreds of dollars on Perez's stolen credit cards. Surveillance video shows a man using one of the cards in San Francisco, a female companion with him. Perez is hoping someone recognizes them and calls police. "No questions asked. If you could just get my ring back to me, I would not say anything," Perez said. "I would even reward anyone who can give me information as to how I can get those rings back." Anyone who may recognize the man or woman in the video footage is asked to call police; leave your name if you want the reward. As for the suspected thieves, Perez is hoping they'll anonymously mail the rings to police.